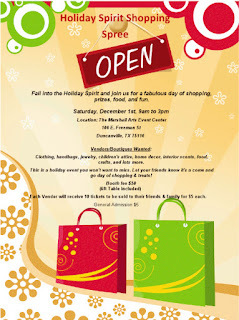 "Fall into the Holiday Spirit and join us for a fabulous day of shopping & food and prizes! This is a holiday event you won't want to miss. Let your friends know it's a come and go day of shopping & treats!" Admission is $5 / person. Booths are 10 X 4 for $50 and will be arranged easily to accommodate (1) 6 X 4 table and up to 2 chairs. Table, coffee, and lunch will be provided. Electricity is available upon request. Each Vendor will receive 10 tickets to be given to and or sold to their friends & family for $5 each. Applications are available here and are due by November 15th, 2012.